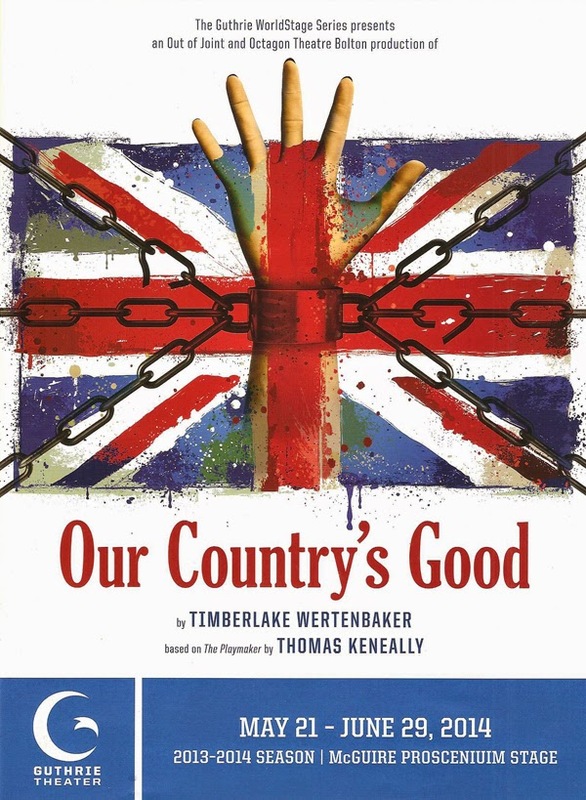 Twenty-five years after it premiered, the award-winning play Our Country's Good is being revisited and remounted by its original director and taken on a tour, which includes a stop at the Guthrie Theater for a month or so. Director Max Stafford-Clark and a couple of theater companies out of England, Out of Joint and Octagon Theatre Bolton, are presenting this story about the first English convicts sent to New South Wales (in Australia), the Royal Marines who accompanied them, and the power of theater to enlighten, educate, and "civilize." The fantastic British cast brings life to this part of world history that I know very little about, in a tale that explores ideas of justice, punishment, gender, class, colonization, and the arts. We follow a group of convicts (some of whose crimes include things as seemingly harmless as stealing food) and marines as they land on the foreign shores of New South Wales and try to build a civilization. Some of the officers want to put on a play with the convicts as actors in hopes of bringing a bit of culture, civilization, and home to this place. Other officers are not so keen on the idea and try to stop it by belittling, beating, and hanging some of the participants. But the show must go on, and although we never get to see what happens after the play is performed, the process of rehearsal improves the lives of these convicts and gives them a new confidence and sense of purpose. Like in prison-based shows such as Oz and Orange is the New Black, the prisoners are humanized as we get to know them, their stories, and how they ended up in this desperate place. All but one actor in this ten-person cast play multiple characters, many of whom are based on historical figures. Each actor creates such distinct characters that they're almost unrecognizable, not just because of the powdered wigs of the officers, but also because of changes in accent and physicality. It took me until the second act to figure out which convict was which officer. There's not a weak link in this cast, with standouts (if I must choose some) including Nathan Ives-Moiba as the good Lieutenant Clark, director of the play, so hopeful that this play will bring light to this dark world and in love with his star Mary; Tom Andrews as the strong and fair Governor and the word nerd convict who also loves Mary; Richard Neale as one of the cruelest officers and one of the most sympathetic convicts; Jessica Tomchak as the timid Mary who gains confidence and strength through her role in the play; and Victoria Gee as Mary's tough-talking friend Dabby. It's always fun when the Guthrie brings in theater companies from across the pond to give us a taste of theater from other parts of the world. I initially miss seeing familiar faces on stage, but after spending a few hours with this cast they become familiar faces. They'll be in town through June 29 so you have plenty of time to get to know them. As someone who believes in the power of theater to change the world, the theme of using theater to harmonize and bring people together is one I can get behind.